Las Vegas, NV-January 12, 2005 - The Law Offices of Benson and Bingham. launched their website today, www.bensonbingham.com. The Company came to Hikanoo with a distinct idea of what they wanted, a simple yet informational portfolio of their service offerings. 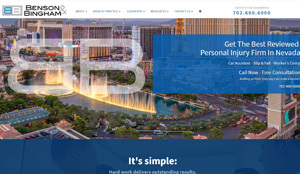 In addition, the site details their Las Vegas legal areas of practice, recent judgments in Las Vegas, and information about the Firm, Benson and Bingham. The law offices wanted a design which associated with their current marketing efforts in the Las Vegas, Nevada area, and consistent with their legal practices and commitment to excellence. The result is a website that truly typifies the companys motto:"The Difference." Benson & Bingham was established in the Fall of 2003 and is comprised of Joseph L. Benson II, Esq., and Ben J. Bingham, Esq., both 2000 graduates of Thomas Jefferson School of Law in San Diego, California. Concentration of their law practice is focused primarily on personal injury and criminal law. Benson & Bingham is a firm that will make a "difference" in your personal injury matter. Hikanoo is a privately held full-service IT solutions provider headquartered in Reno, NV. The company's core technical expertise includes interactive web development, customized e-commerce systems, search engine optimization and site marketing services. ©2018 hikanoo. all rights reserved.